For every action, there is an equal and opposite reaction. I bet we’ve all heard this before. 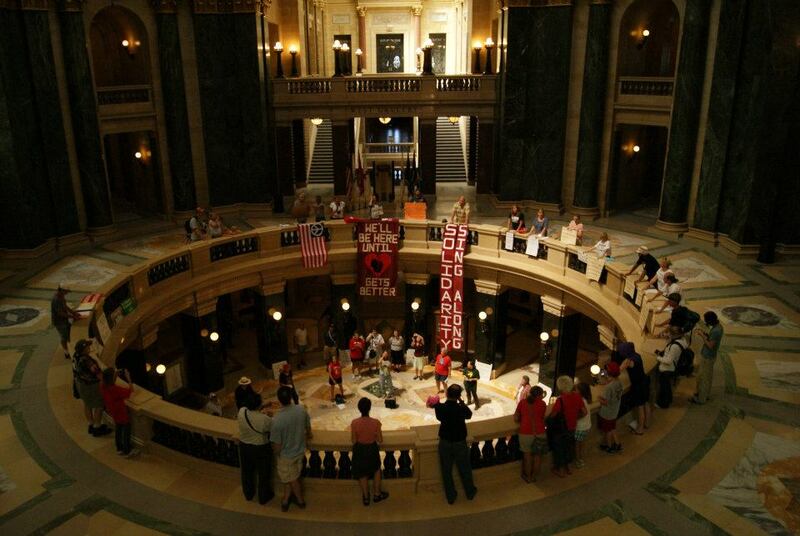 It played itself out Monday in the Wisconsin Capitol building. 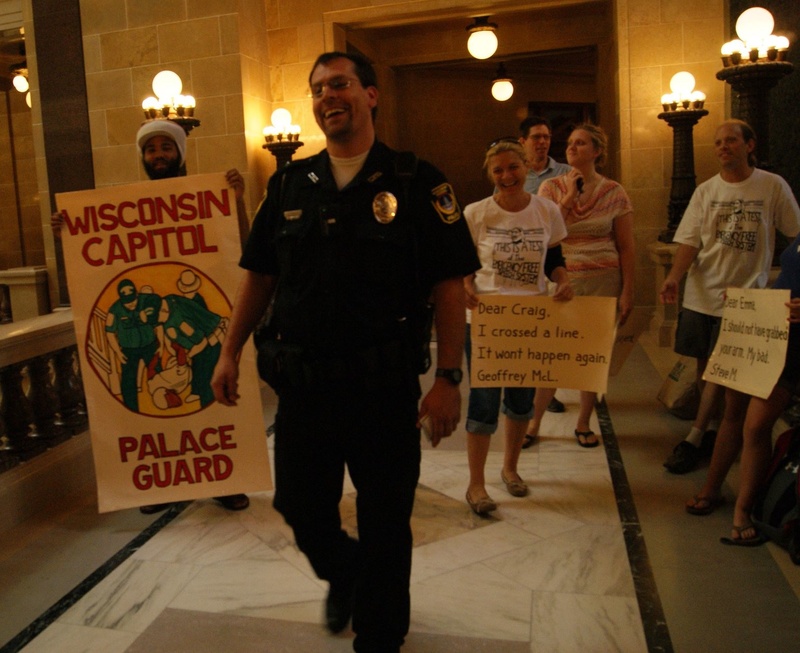 Since the recall elections, the Capitol Police have shown a renewed interest in those of us who keep returning day after day to sing and hold signs and banners. Some of us have even been individually approached by the police, asked why we keep coming back, and what purpose we serve by continuing to display our signs. Considering the Capitol is a public building, I do not believe ANY purpose is necessary, so this seemed to be a strange question. It also seemed strange that the police were suddenly very visible. In the past, the police usually kept a watchful eye over us but tended to stay in the background, at times being as elusive as the capitol squirrels. For the last few weeks, though, the police started to blend into the mix. They would gesture as if counting how many people were there and started taking copious notes. When asked what they were doing, they would refuse to give an answer and walk away. The notes we were able to glance at consisted of descriptions of the citizens and verbatim accounts of the signs and banners. 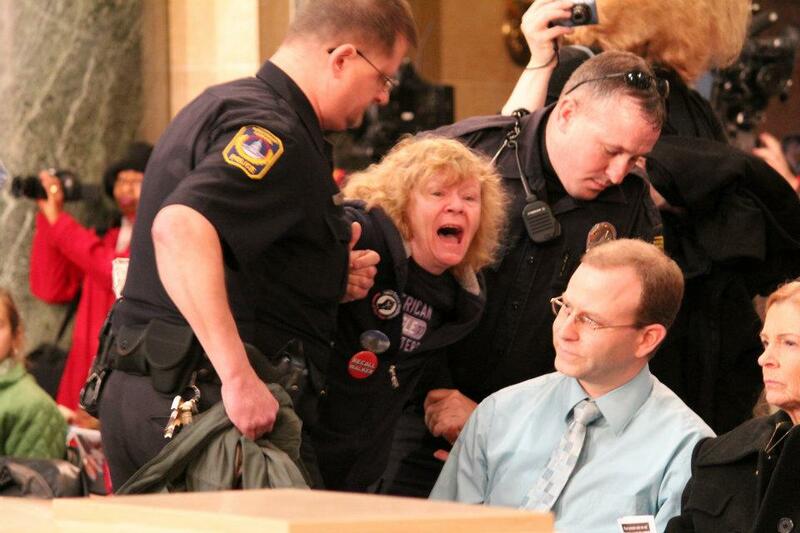 Another interesting thing is that this behavior only happened when inside the Capitol. On Fridays, when we are larger in number and gather outside, there appeared to be no note taking going on. Curious. Rather than let this strange behavior continue to bother us, we came up with a plan. If the police wanted to become stenographers, great. We would get them to apologize to us – in writing – for some of their past transgressions. They could promise to never lock us out of the capitol again. They could apologize for dragging us out of ceremonies we had every right to attend, and for physically harming us while we gathered to petition our government. We may not have a sign for every affront and indignity we suffered, but it would be a start. It would be cathartic and healing to make these palace guards acknowledge the way they have treated us. So, at the 400th Solidarity Sing Along, there were a few more signs than usual. The mood was festive and fun and I do believe the healing process started. Now that we have some acknowledgment from the Capitol Police, even if it wasn’t intentional, we should also realize that they are deserving of apologies, too. After all, they are a part of the public most affected by the changes made in the name of austerity. They have been trying to do their jobs in the midst of the craziness that has become Fitzwalkerstan. They have been asked to follow unconstitutional orders. They have been told to arrest people who are not breaking laws. If they refuse? I imagine they may no longer be employed. 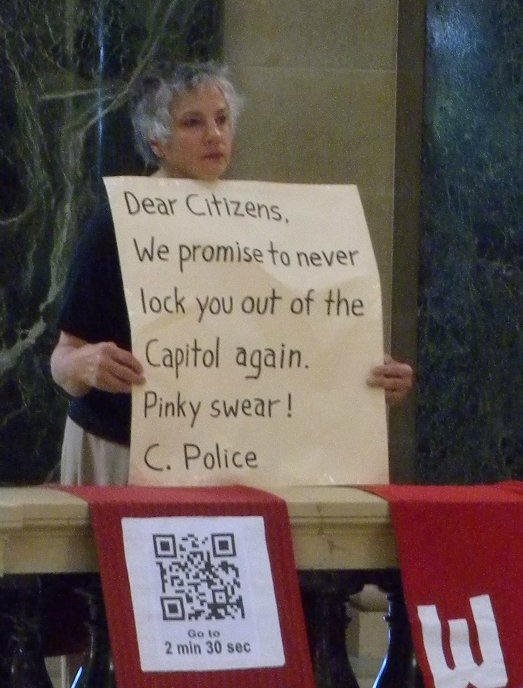 The Capitol Police truly are between a rock and a hard place. They are the foot soldiers on the front lines taking the brunt of the anger for the powers that be. They are also as likely to get apologies as we were. So I say: Let’s do it for them. Sorry we are so vain that we make you arrest people with cameras and remove them from the gallery lest they take an unflattering photo, contrary to state statute. Sorry we made you lie to citizens. You lost your good name and they lost their rights. It was a no-win situation. Good luck with your new job! Sorry about the divide and conquer thing. Sometimes I don’t realize how many people I am hurting. Linked photos by Erica Case, Lisa Wells, Callen Harty and Craig Spaulding. Linked videos by philgarlic and Nicole Desautels Schulte. NO! ABSOLUTELY NO! Those pigs do not deserve apologies. We have not done anything wrong. They have betrayed the working class, and for that they loose all respect. They deserve to be mocked, chided, run out of town for what they did. Yes they are human, and humans make mistakes, but let them make them in an other community. I think they know that if they arrest us for singing, the next day, ten times as many people will be at the Capitol, singing. So what to do? Stand around, take notes, and PRETEND you have a plan and know what you’re doing. Plus, they know that any tickets they write are going to get dismissed by the Dane County DA. The note-taking reminds me of an inexperienced and in-over-his-head middle-school teacher shouting, “This is going on your permanent record!” If you haven’t earned our respect, and we’re not afraid of you’re threats, then you’re really not in control anymore.